Objective: Physical activity is an essential component of a woman`s ability to maintain or improve her level of wellness. Nevertheless, less attention is usually heeded by women, particularly young girls, to the health promoting behaviors such as regular physical activity. To determine the influence of physical activity and BMI on menstrual characteristics and menarche age among young females according to their SES (Socioeconomic status). Materials and Methods: Data collection was comprised of two parts. First, a cross-sectional study was conducted on 1,000 healthy and young females aged 11-28 years; standardized self-reporting questionnaires were used to obtain relevant information. In the second part, purposive sampling was done to compare the information pertinent to physically active females with those that of the inactive or the sedentary in behavior. The data were later analyzed using Chi-square (χ2 ) test by SPSS 16. Results: The majority of the young female population were physically inactive and only 121 subjects (12.1%) enjoyed exercising at least for 30 minutes, three times a week or more. There was a significant correlation between BMI, SES and physical activity involvement. 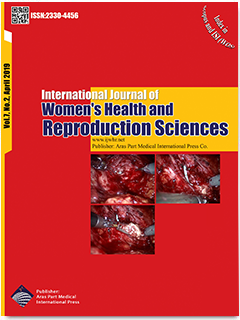 The cycle length, regularity of periods and severity of dysmenorrhea exhibited positive association with involvement of physical activity. Conclusions: Physical activity had positive influence on menstrual characteristics in young females. Therefore, in order to modify or reduce menstrual cycle disturbances, it is important to educate women for regular physical activity.